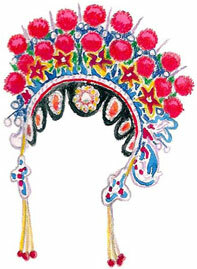 Cantonese Opera (Yueh-chu) was a popular form of entertainment for Chinese immigrants living in Canadian citites. The enchanting love stories and family dramas provided a contrast to the realities of life in the Exclusion Period (1923-1947), a time when restritictive Canadian immigration policies separated parents from children and husbands from wives. The earliest known performances in Canada occurred in the 1880s in Victoria and Vancouver, British Columbia. Sponsored by local merchant companies or volunary associations, professional opera troupes from Hong Kong and Guangdong Provice, China toured North American cities in the early part of the century. From 1923 to 1947, the Chinese Immigration Act, 1923 virtually halted immigration from China but male and female opera actors were able to enter the country on temporary permits. Some of them, such as Tuey Ping Lee-Hum and Deer Gar Yin remained in Canada instead of returning to war-torn China.